This student has begun their organizing by listing their projects they have completed (or intend to) and which sketchbook pages/screens will best represent each project. 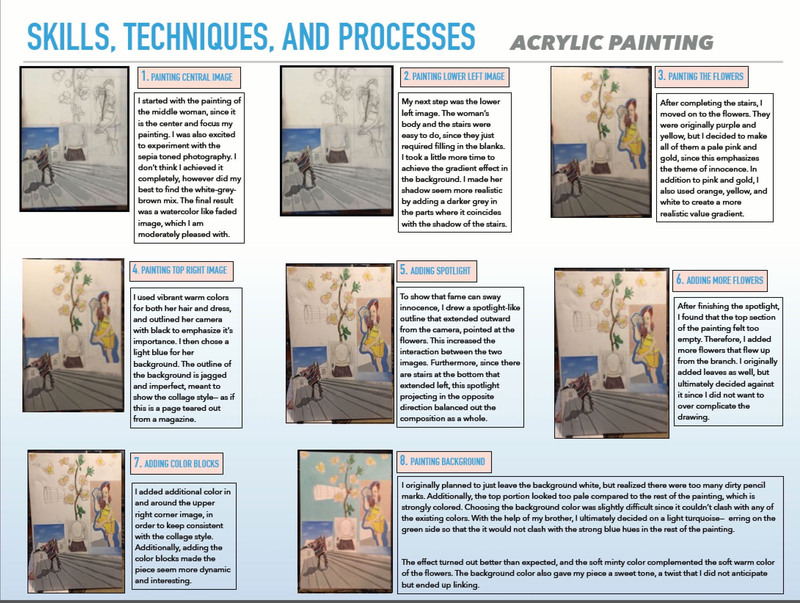 I encourage students to create Process Portfolio screens periodically throughout the first and second year, so many screens may already be complete and you could (should) have a strong idea how you will complete your best screens for submission. It is important that you discuss and articulate your ideas/thoughts/reflections throughout your Process Portfolio. Also, ensure that you present strong reasons for your ideas. The examiner wants to see how your pieces evolved. 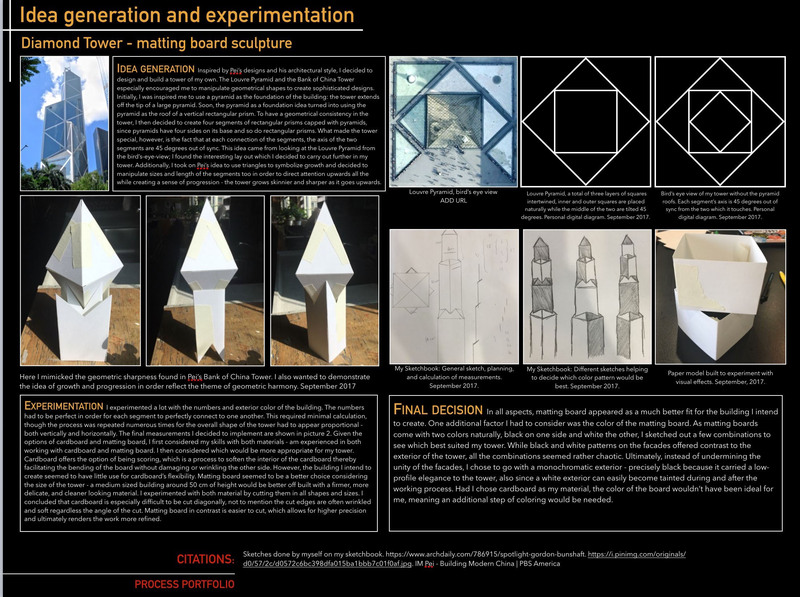 Strong portfolios show how ideas, materials and techniques evolved and developed – including failed experiments/ideas rejected, changes in composition. Stronger portfolios show how students continue to explore and experiment all the way through in order to resolve problems. Weaker portfolios often show work when it was half-way through the project with no explanation on the ideas surrounding the piece. Weaker portfolios also tended to be much more teacher directed and prescribed “Our teacher told us to do a bust….”. This is incredibly limiting to students and does not allow them to develop their own ideas. The following breakdown will give you a good start at setting up your PP. However, you will have to organize it according to each project. I suggest you work chronologically with your first project, showing also skill and knowledge growth and development as you move through the screens. This screen you discuss early ideas. You can add sketches that you had originally done of your first idea as well as photos you took and/or artist’s works that may have influenced your thoughts. What is your general idea? What does this idea mean to you? What is the personal relevance? What are some first ideas for art pieces that you have? Brainstorm ideas that can connect from your first idea. What initially caught your interest/inspired you? What artist(s) has inspired you? 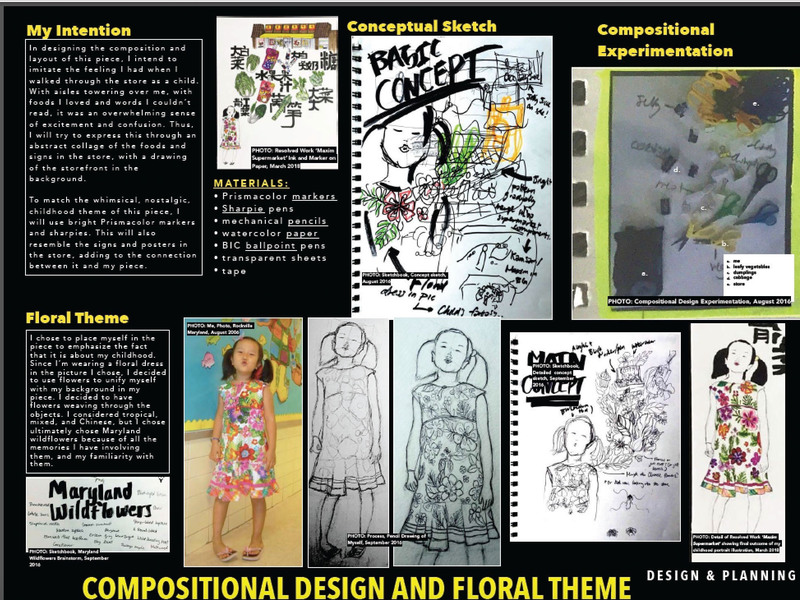 Add some developmental sketches of first thoughts for your art project. Here are some examples of screens showing Initial Intentions/Ideas. You will notice that they are all quite varied. Some adding sections of sketchbook pages, some adding full pages. 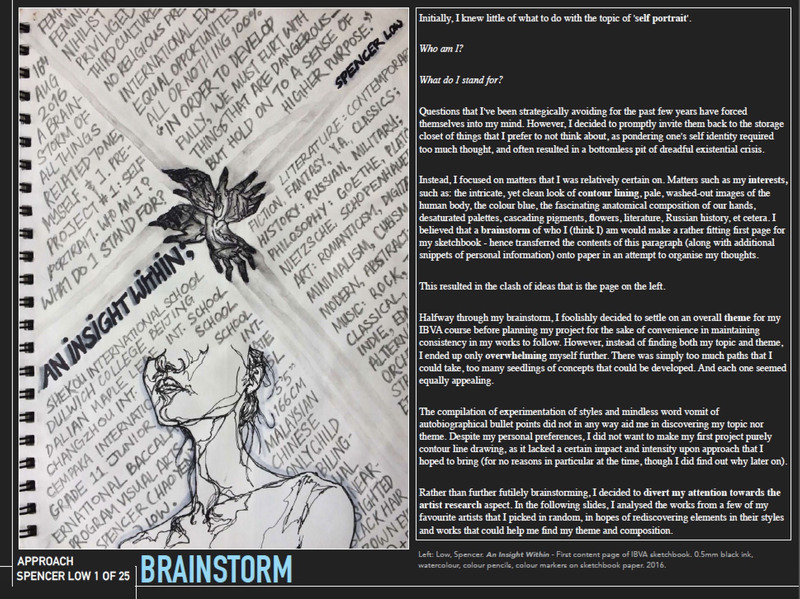 This is a typical brainstorm page from beginning of Year 1. 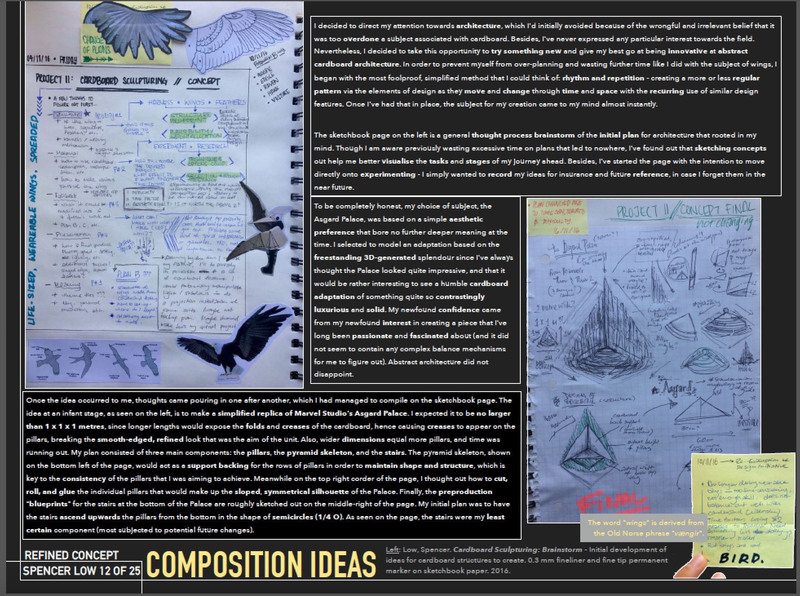 The student added text to the side explaining and giving more detail to the ideas presented in the sketchbook page. This screen is a good example of explaining initial ideas for a print project. Found images are supported by explanation in the text. The sketchbook page shows beginning ideas for a portrait project. This screen also touches on artist connection. This student is explaining idea and intentions for an illustration project – but also discussing composition ideas at the same time. 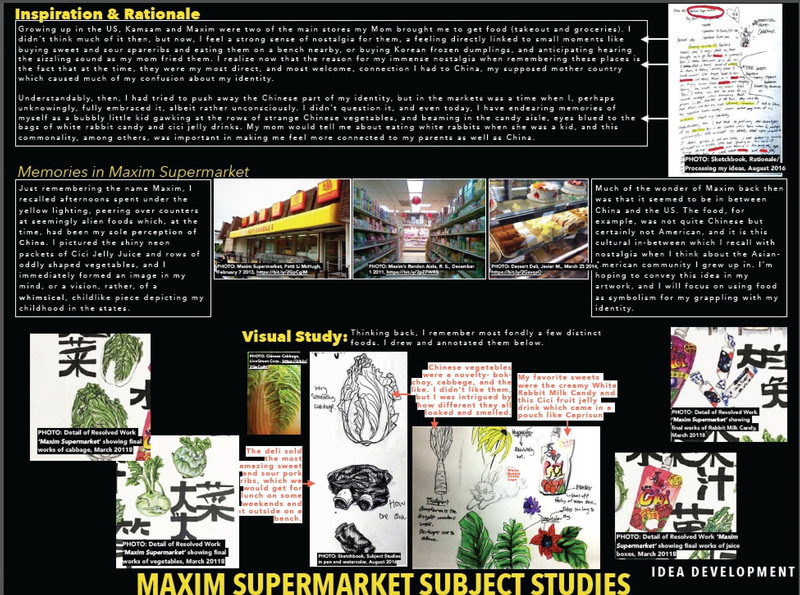 This screen partners with the screen previous – with the student exploring her idea of the supermarket in more depth. Idea Development is a very important stage – too easily overlooked. This is where your experimentation of thoughts/materials/medium happens. This section encompasses a large area – of probably alot of your work. 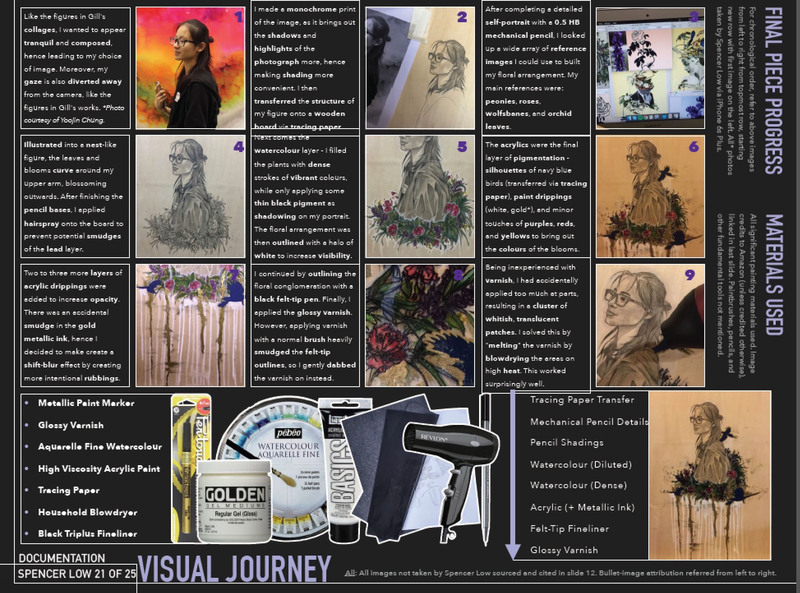 So these screens will surely be heavily image based – and could very well include multiple photos of pages from your Visual Arts Journal. 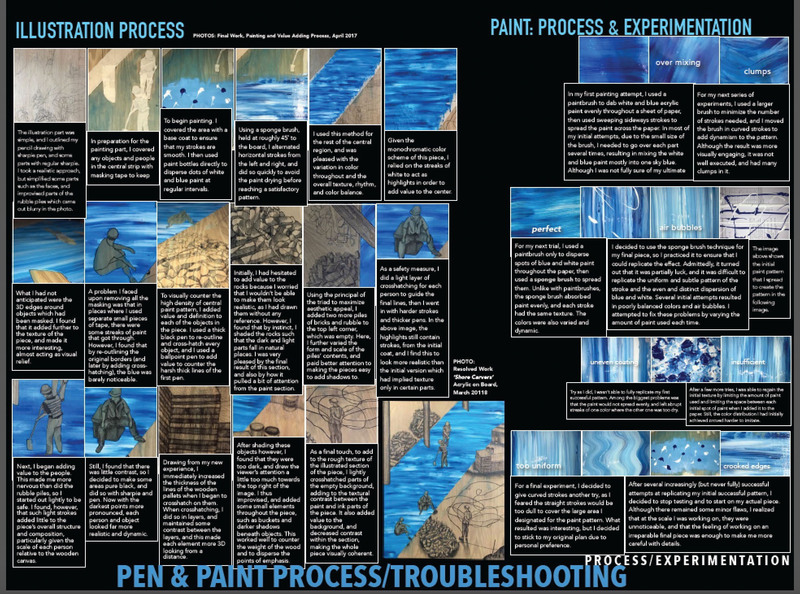 It is important to show experimentation or exploration, not simply photos of pieces in process. Candidates should show exploration of a variety of techniques (even if these are not used). This is for all media – digital media should include screen shots of different composition and techniques etc. 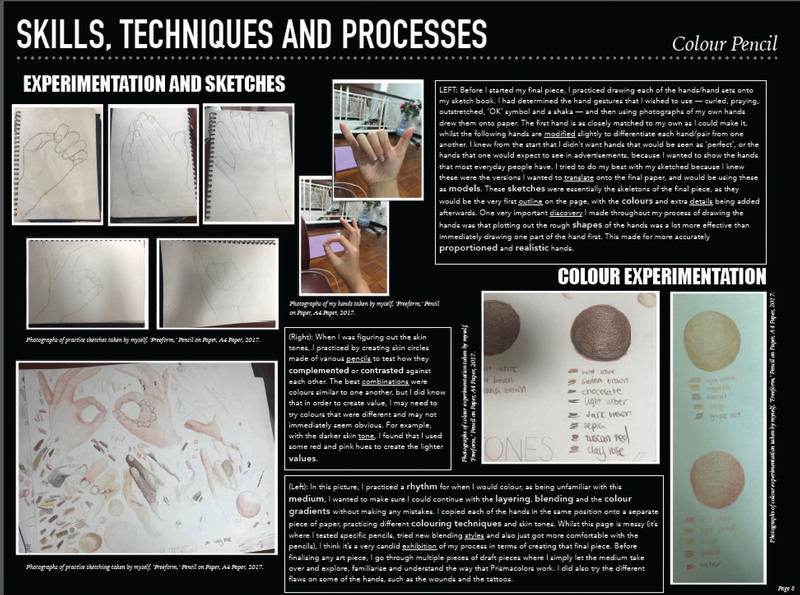 Strong candidates fill pages with technique experimentations and explore the possibilities deeply. Weaker candidates showed only the development photos of each piece – sometimes one per page. 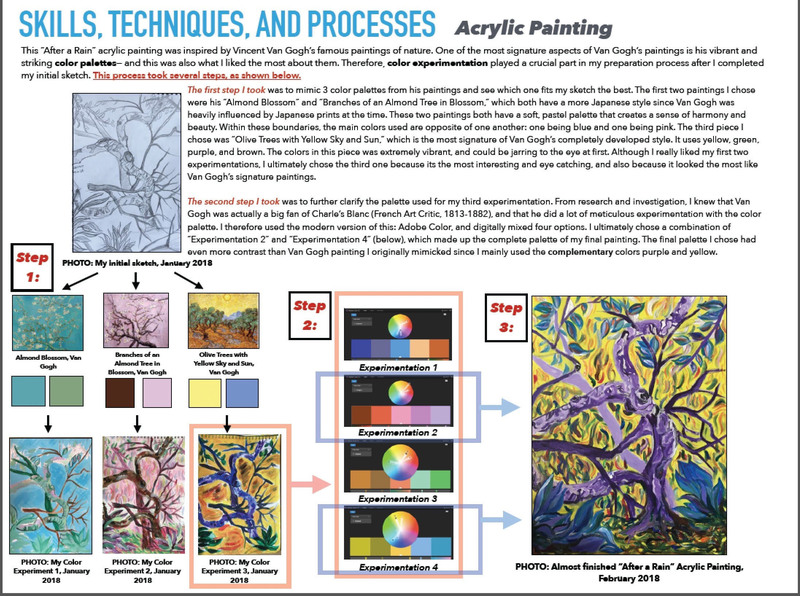 Your ideas can be sketches – but can also be photos – if you are experimenting with different mediums, or arrangements or colors… so many ways to show experimentation. Discuss how your are going to make your idea work. 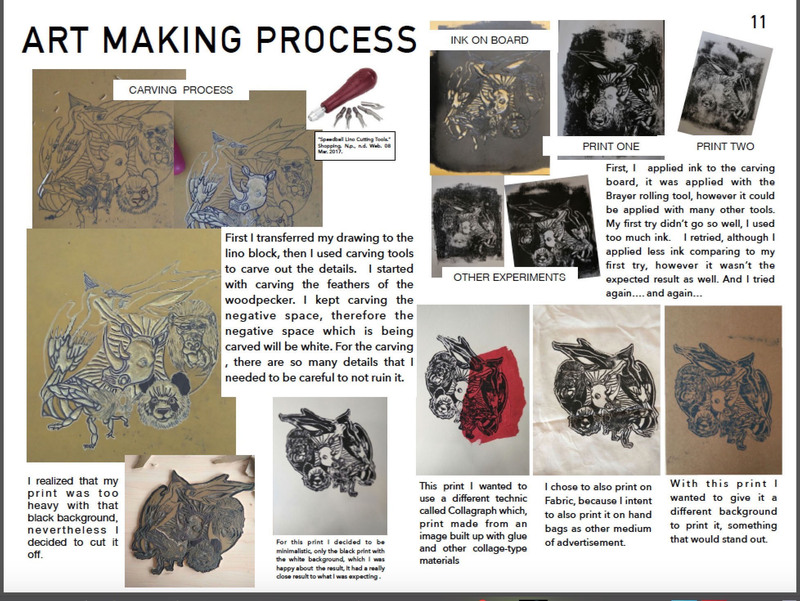 This screen shows students experimentation of sculpture form. 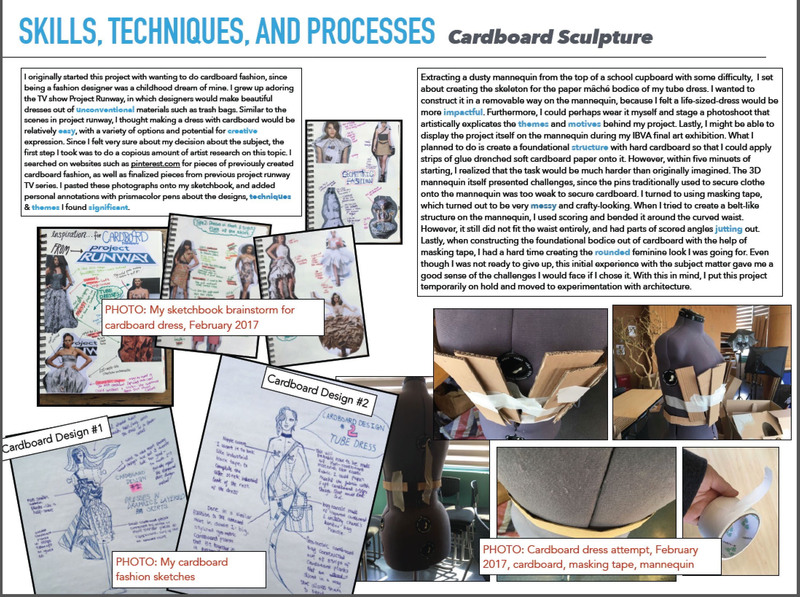 This screen shows some experimentation of the corset of the sculputure and sketches of brainstorming and composition design. The corset actually turned out to be a failed project. 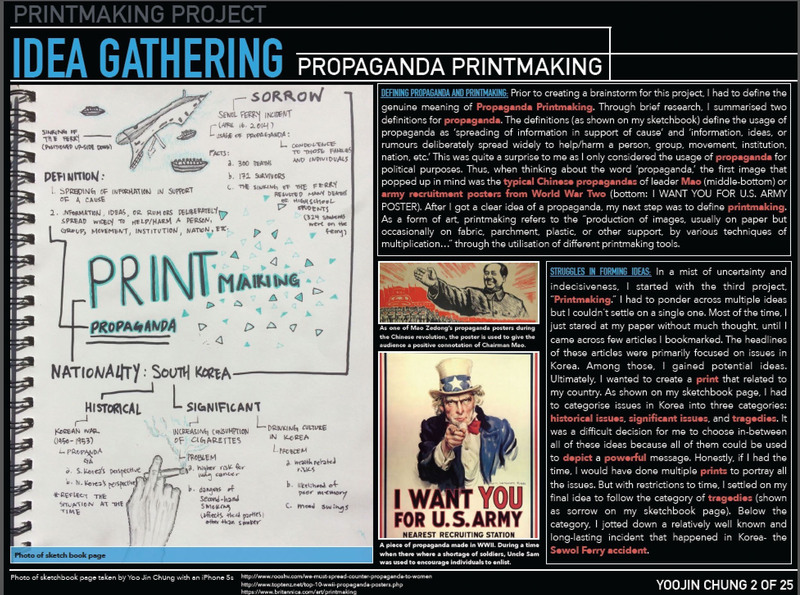 it is important not just to show research into other artists, but also to show connections between the artists studied and the impact on candidate work. There must be a visible connection between artists studied and student own work. 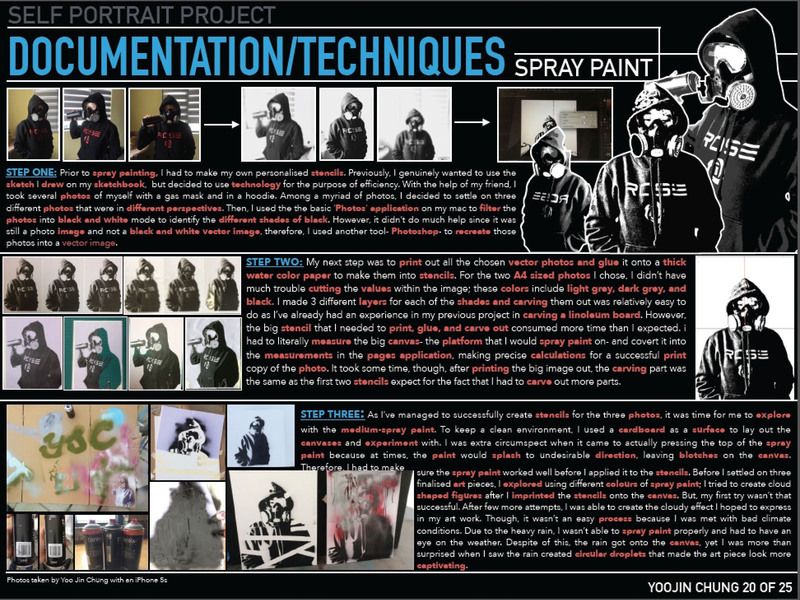 Candidates should aim to critically analyse artwork studied, and not include large chunks of biographical information. Strong candidates had clearly researched artists that were of personal interest to them, not just those suggested by . the teacher (ie. avoid the dead white guys!). Weaker candidates included artists that they like or had seen in a museum visit but did not connect to their own work. You need to do a re-creation of the artwork you are analysing. You can literally try and copy it exactly – or copy sections of it – and/or try another image in the style of the artist. Discuss how the artist relates to you and how the artist/artwork inspires/influences your artwork. Why are you interested in this artist? What is the personal relevance of the artist/artwork to you? What is cultural/historical relevance of the artist/artwork? Discuss how you are going to use this artist’s ideas/techniques to inspire your art work. 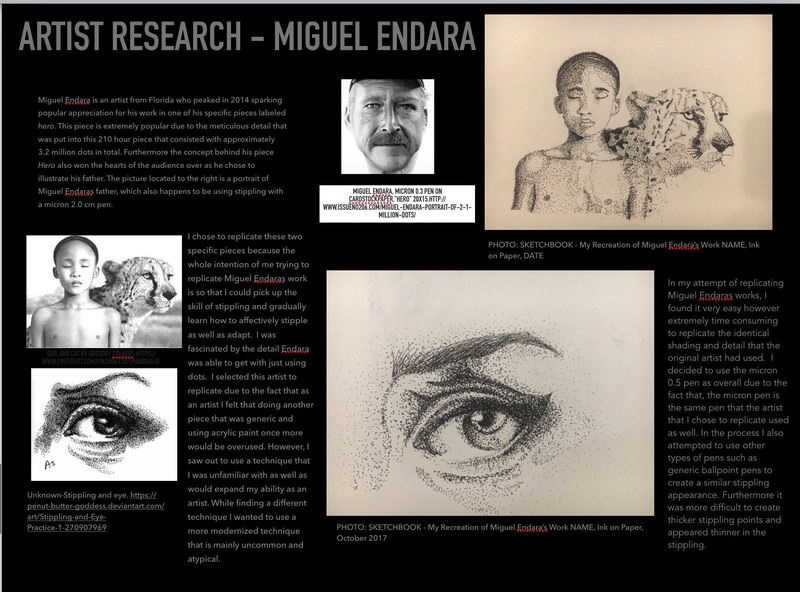 This screen shows strong re-creations of Endara’s work. Subsequent screens show the final work which was also done in stipple – which created a strong connection. 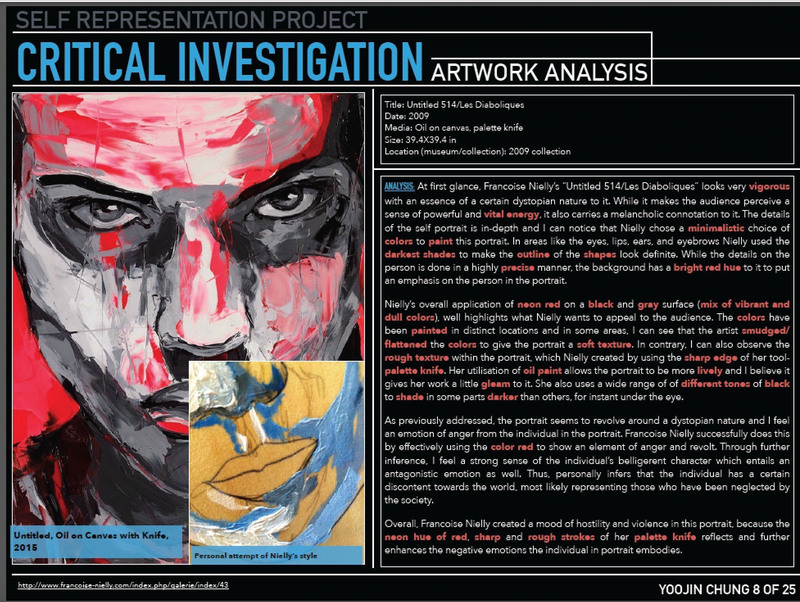 This screen shows artwork analysis of Nielly’s work. 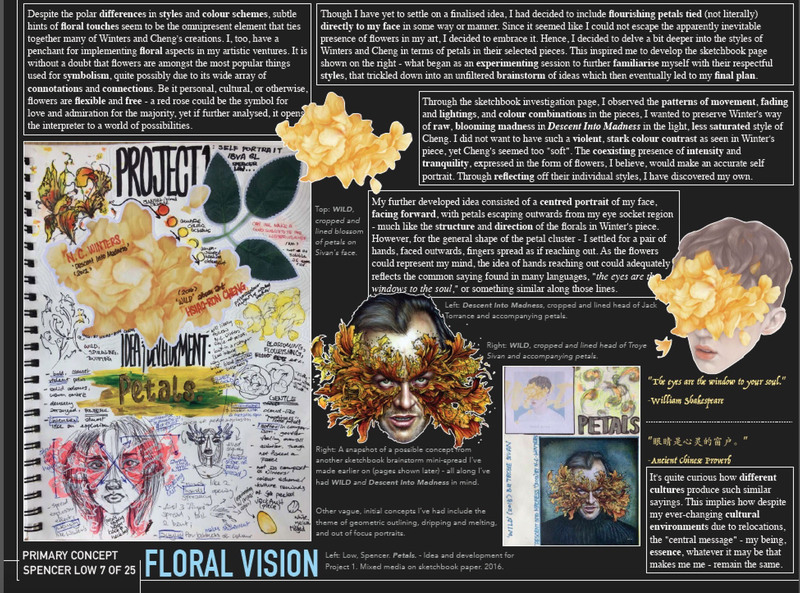 The student has overlapped her work in progress showing the connection between the influence of the artist. 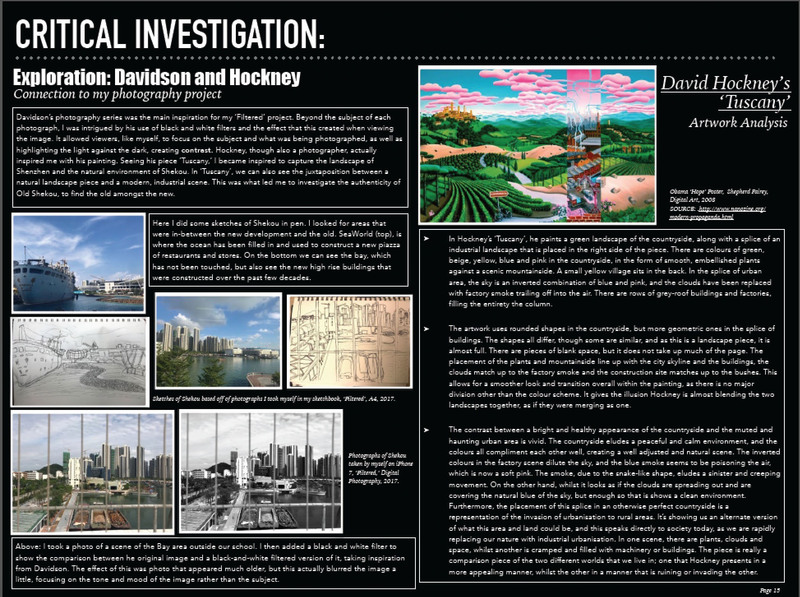 This screen shows an analysis of Hockney’s work and explains how the student used his ideas in her work. Some recreations are presented. I would like to see more sketches/a clearer connection to the student’s art form. Again – another super important screen. Do not miss this. 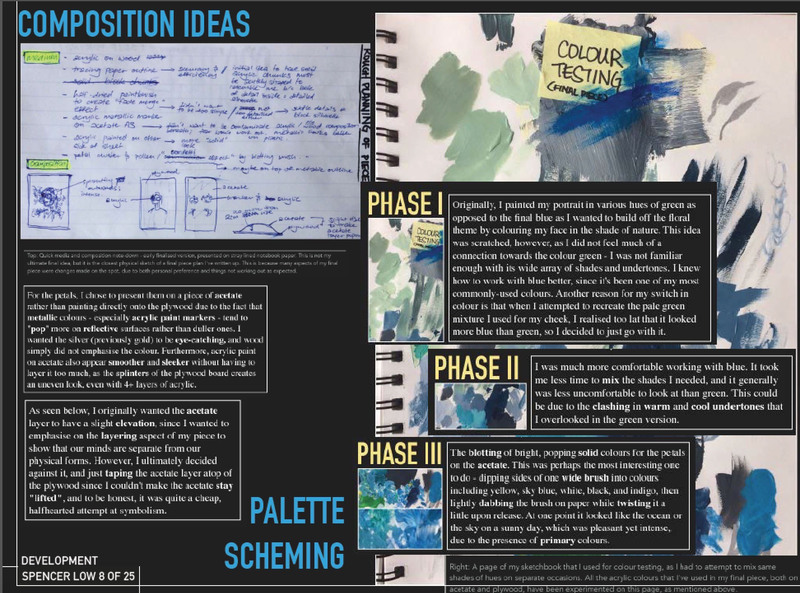 For IB – the expectation is that you create AT LEAST 3 DIFFERENT composition ideas and then discuss what makes each successful or not so successful. Use composition strategies like Rule of Third, Rule of Odd, Golden Mean, Formal Balance to organize your ideas into various compositions. Once you have chosen your ‘strong’ composition idea, then it is *HIGHLY ENCOURAGED* that you experiment with color schemes and/or scale(resizing) to create the composition that most strongly delivers your message. This is where all the photos of your WIP come in handy. Sadly, IB PP is not equipped for time-lapse videos. Comment on each step – what you doing, what materials you are using, what is successful, what is challenging. 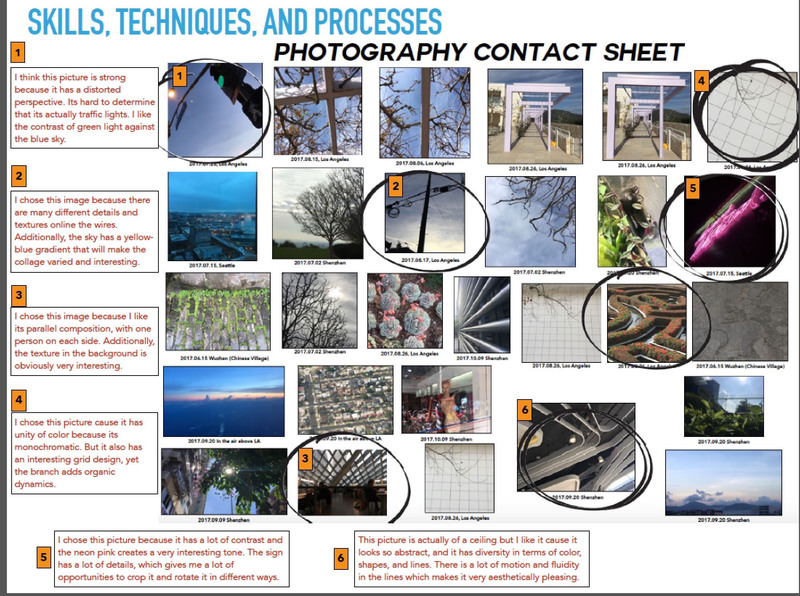 This is an excellent example of a typical process – step by step development of the work with explanations for each photo. 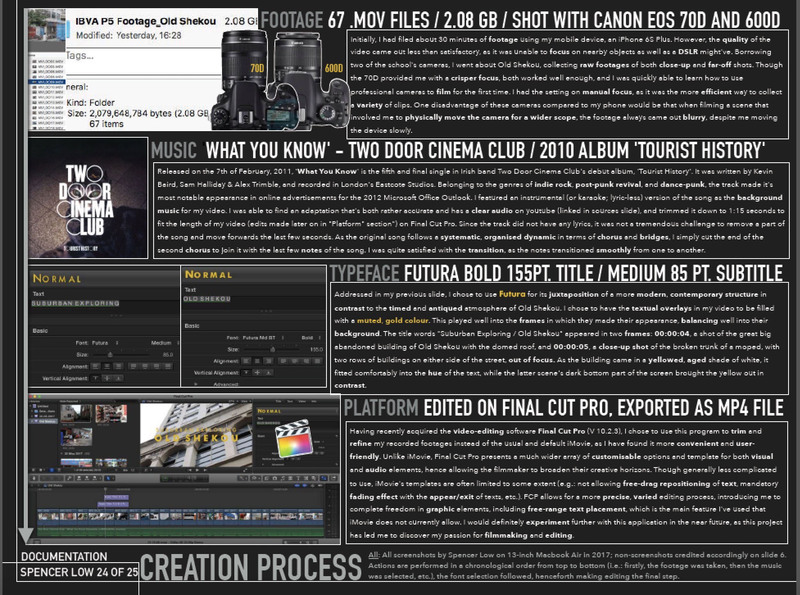 This screens shows how to show the process of video editing, taking screen shots. Also a nice option is to screen shot the storyboard. If you take alot of photos for a project, a good idea is to create a contact page – showing all photos of the shoot and then circling and explaining the photos you use and/or consider strong. Another take on photo contact sheet. It is not enough to just create a reflection of your project – as the rubric calls for review, refine and reflect. So in order to satisfy this requirement, you should look at your earlier works and see how you can re-think and/or refine some of your ideas to create a stronger work. You should strive to have at least one screen discussing how you have refined an idea. What new ideas have you learnt/found out that you think will make the project more successful? 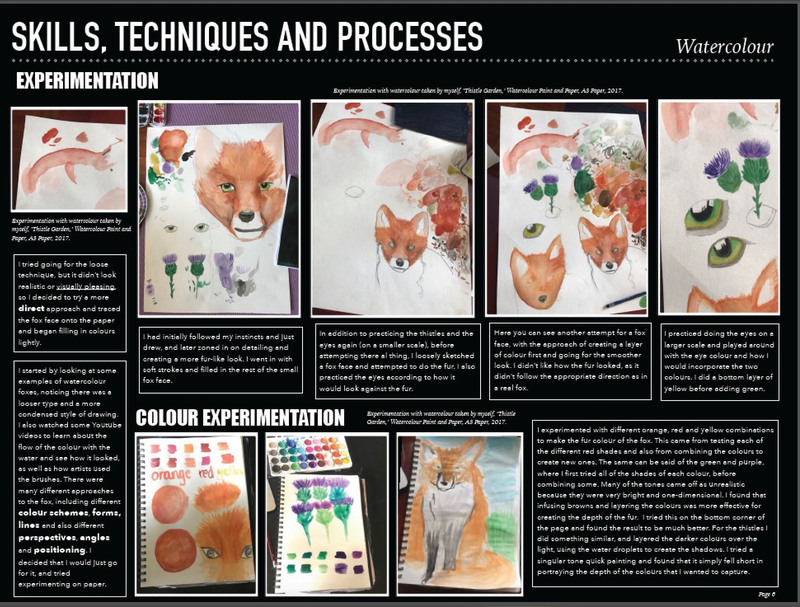 Here are some examples where students refined and/or re-assessed parts of their projects. Some admitted their failures and explained why. Others reworked previous works in a different direction. These screens are usually easier to create in your second year after you have time to reflect and assess your work. If you have that one project – that doesn’t seem to be working – you can rethink the ideas and/or refine. 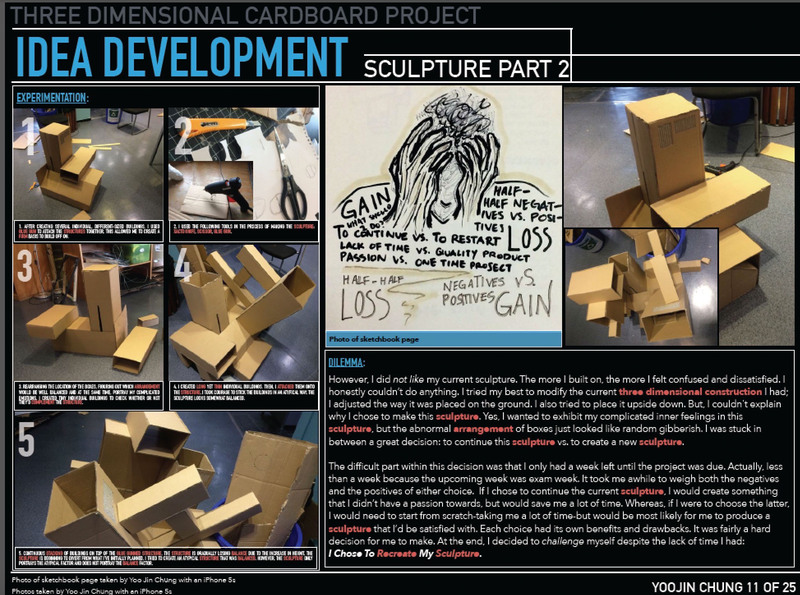 This screen shows a student attempt to refine a sculpture project – that sadly could not work. This screen partners with the one before, with a refined concept of the original idea. Which again did not work. A month’s work that just didn’t make it. This screen shows some material experiments and some failed attempts at materials that worked/didn’t work. This student felt like her fox portrait lacked background and so refined her idea. She experimented first with digital photos and then took inspiration from her Scottish heritage and created the plaid background. This screen shows a students original spider watercolour, which he loathed, but then reworked the original outline digitally to create an intricate geometric pattern. The idea was then to print the pattern on fabric. Every project needs a reflection. A good rule of thumb is to use Feldman’s Analysis – but aimed at your project. What was successful in the process and in the final work? What challenges you had during the process and what you did to solve them and/or how they changed your direction? What was your initial intention with this artwork – were you successful – or did it change direction? Why? 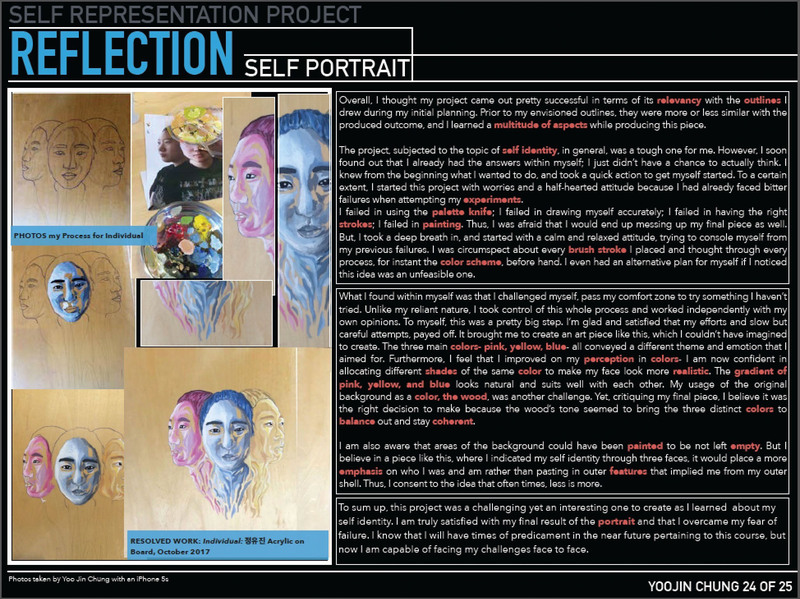 Include photos of your final ‘resolved’ work. 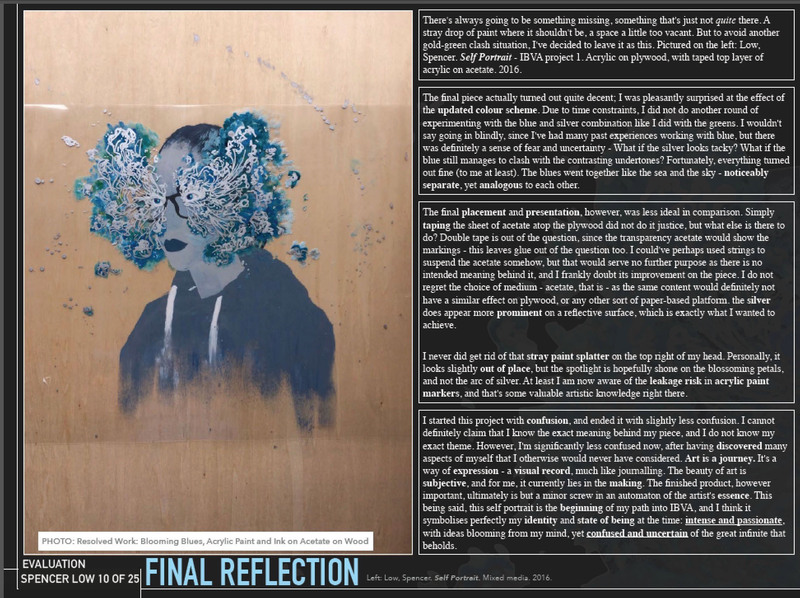 This student added a photo of the resolved work beside the reflection. 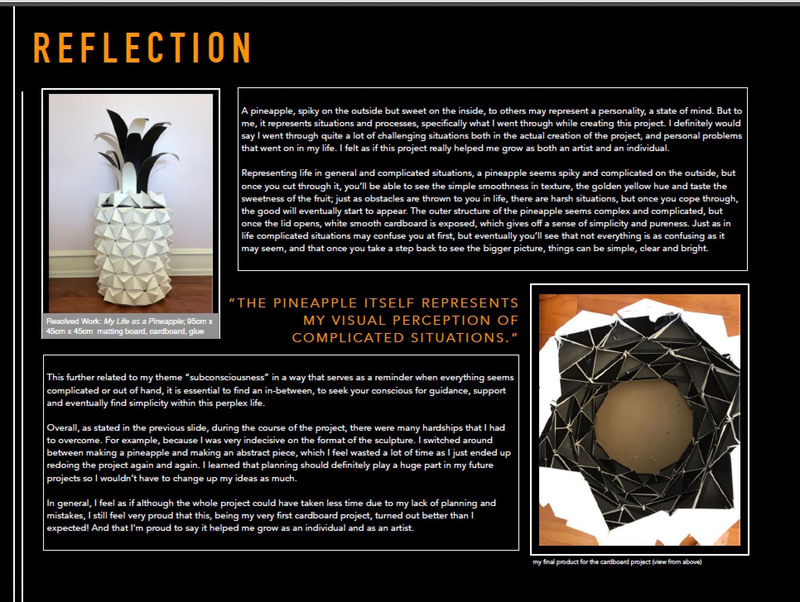 This student chose to show various views of her resolved sculpture piece, which helped to understand her conceptual thoughts about her work. 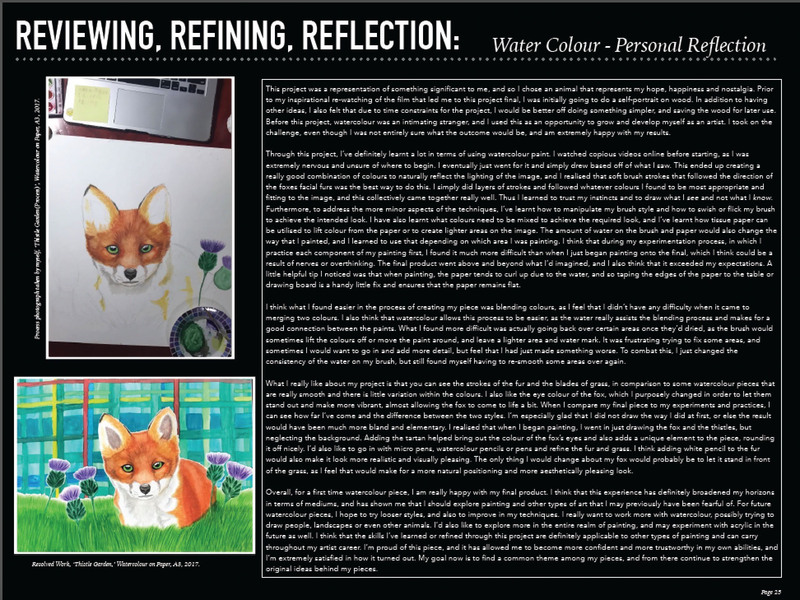 Adding the background was an important refinement for this piece and so the student decided to show both versions beside the detailed reflection text. THINK YOU DONE? THINK AGAIN.